A classic that all those who shot in the 80’s and 90’s know well. The spitting image (save a couple of slight changes to aesthetics) of the military surplus rounds for the AK-47, clones and SKS platform, this round is an obvious winner. This newer version is actually just as good as the older military surplus ammunition, but it has definitive benefits over its predecessor. The non-corrosive primer and powder make it easier to like this ammunition, and the non-lacquered steel casing means less sticky residue on your fingers from loading. The steel cartridge case feeds reliably in most firearms chambered for this round and the FMJ design is in the same grain weight as the original (123 grains). The terminal ballistics are substantially similar. 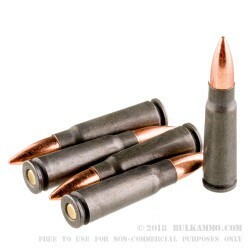 For those who want cheap ammunition to shoot out of their AK variant/clone or any other 7.62x39 firearm, this is not a choice, it’s the obvious choice. The low cost, high reliability, excellent consistency and longevity on the shelf means it is a special kind of bargain for high volume shooters. This round excels in all 7.62x39 firearms, but is particularly good for military style surplus firearms with semi-auto actions. I personally havent had any major issues with this ammo. Never any Ftf or Fte. 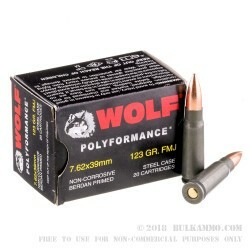 Great for plinking, not bad stuff, and its a good value. 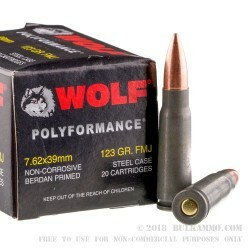 Q: If this wolf ammo in 7.62 x 39mm comes in a spam can, how long will it keep and maintain its quality ? if it is not stored in a spam can, what is its shelf life and reliability ? A: Ammo stored in a temperature controlled dry environment the ammo could last for many years. Drastic temperature changes and differing amounts of high humidity affect the shelf life of ammunition. In a spam can, unopened this will easily last decades. My ammo typically does not last near that long as my stuff typically gets rotated out at maximum of 18 months. Long term storage is placed in ammo cans with moisture and oxygen absorbers and once sealed do not get opened again. Ammo stored in this manner can last 20, 30 or even 40 years. 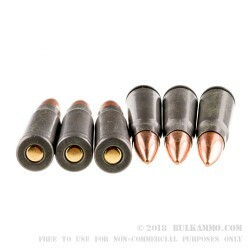 We have surplus ammo on the site that is near 30 years old with lots of positive reviews.